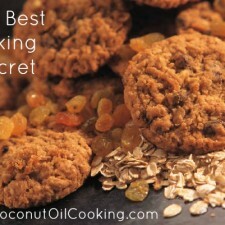 Oatmeal Cookies made with Coconut Oil! I wish I was exaggerating the amount of times I tell people that my all-time favorite use for coconut oil is in baked goods. 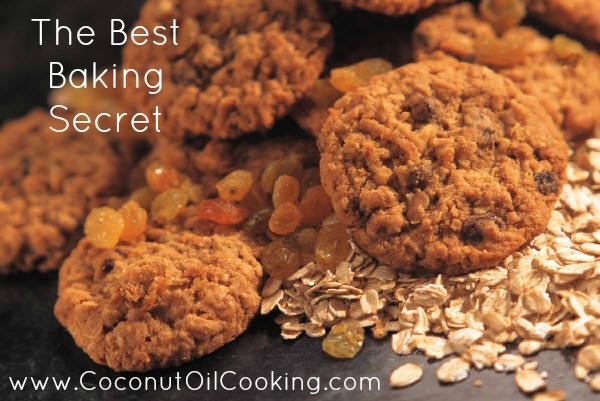 If you haven’t tried baking with coconut oil then let me tell you – you’re missing out! Coconut oil is a healthy fat which can be substituted in cooking or baking for butter or oil in any recipe. From my baking experience in the past, I would run into issues of cakes being dry, hard cookies that would crumble and breads just didn’t have the texture I wanted. Using coconut oil in my baked goods has solved all of those problems and made my recipes bursting with flavor! To use coconut oil in any recipe, simply replace butter or oil for coconut oil in a 1:1 ratio – it’s that easy! Coconut oil is a plant based saturated fat, which makes this oil great for gluten-free and Vegan recipes. Below are a few of my favorite baked goods that contain coconut oil. I promise that once you try this, you’ll thank me. Oatmeal Cookies – This classic cookie can be made the traditional way or spiced up with chocolate chips and cranberries. The combination of coconut oil, oats, and cinnamon will leave you with a whirlwind of flavor that will have you coming back for more! Pumpkin Bread – In my opinion, you can never have enough pumpkin. Even in warmer months, I’m still making anything pumpkin that I can. The texture of this fall favorite comes out absolutely amazing with coconut oil – just be sure to not eat the whole loaf at once. Try adding some of this coconut oil honey “butter” on top of your slice. S’mores Brownies – Brownies have always been the hardest to master, especially when I want that fudgy and chewy consistency all in one. I have found that using coconut oil and under baking my brownies by just the slightest bit have really helped with creating the perfect batch. With this recipe, I added chocolate, graham crackers and marshmallows for extra sweet s’mores combination. Cake – Who doesn’t love cake?! This has always been one of my favorite baked goods to make. Coconut oil goes great with any flavor cake you decide to bake, especially chocolate. This lemon cake with cream cheese frosting is still my number 1 recipe to whip up during summer time. I hope that after reading these tips, you’ll give coconut oil a try in any recipe, especially when baking. What’s your favorite baked good to use coconut oil in?